This was a better week; though I had to miss my Tuesday swim, I managed three runs, with some reasonable distances. It would be good to get a fourth in, but hard to find the time. Wednesday was a Striders evening, and we went to the seafront for interval sessions, a six minute session. We run hard to a set point on the seafront, one of the shelters or cafés, turn and return to our starting point, then recover until the six minutes has elapsed, then start again. After the first interval, a shower caught us. It was hard work, and one of our number pushed himself so hard he was sick over a wall. Be assured, gentle reader, that I did not. Saturday was a more relaxed affair, the Bevendean Down #parkrun, in the company of Sweder. It felt cold to start with, but after the first lap I’d warmed up considerably. My companion is pursuing a heart-rate based training regime at the moment, so we conducted a conversation as we ran, even on the tough ascent. In spite of this, my time was not discreditable. I was, of course, saving myself for the Crowborough 10k, the last run of the week. The Crowborough 10k is the last event in the Sussex Grand Prix, and a hard two-lap course. There’s a downhill, a ford, and then a muscle- and will-sapping ascent, up Palesgate Lane. And then we did it all over again. I found the second ascent hard and my knee complained. Now it’s stiff and swollen. I dare say a day or two’s rest will do the trick. There were plenty of Striders involved, with some very impressive times. Josh Rudd was the first Strider home, 12th overall, in The prizes were presented by Britain’s second fastest lady marathon runner, Mara Yamauchi. Alas, I did not have the honour to shake her hand on the podium. I didn’t run this event in 2015, was faster in 2014, but slower in 2012, so that’s not too disappointing. Next week may be a little light. I’m doing the results at our Mince Pie Ten Mile on Sunday, so I can’t see a long run happening. 91 days till the Brighton Half. A light week, perforce. I couldn’t run with the Striders on Wednesday, being on my way back from London, and today’s Brooks Brighton 10k was cancelled, thanks to Storm Angus. No matter, I managed a swim on Monday, an evening run on Tuesday, a seafront morning run on Friday and, in lieu of the 10k, I was able to participate in the first anniversary of Lewes’s legendary Twitten runs. It’s an ill wind, one might say. Next week will be better; I’ll be able to attend the Striders so that should be good for 5 or 6 miles, including some speed work, and I’ll run the Bevendean Down parkrun on Saturday, as well as the Crowborough 10k on Sunday. Crowborough can be vulnerable; the highest town in Sussex, the 10k failed to happen in their 25th anniversary year because of snow. Let’s hope it doesn’t happen this year. 97 days till the Brighton Half. The first week of training for the Brighton half marathon is over, and there are fifteen more to go. This week comprised some speed work with the Striders on Seaford seafront, an early morning run on Friday, and today the second event in the East Sussex Cross Country League 2016-17 season, the Warren Hill race. Warren Hill takes place just outside Eastbourne, on the downs inland from Beachy Head. After some reading and a minute’s silence, it being Remembrance Sunday, we set off. The route takes runners through the car park where we left our cars, and on a long descent, till we saw BIrling Gap and Belle Tout not far away. A herd of kamikaze sheep decided they had to cross our path. At the bottom, I expected mud, after heavy rain the day before, but apart from the odd puddle, it was reasonably firm underfoot. Then, after running along the bottom, at about the three mile point we turned and started the long climb back to the road. On the lower slopes, I was overtaken, but as we neared the road, I was able to overtake others. Back on the road, and then a short uphill to the finish. Here too, I caught up with some other runners, and was ticked off for my lack of gallantry in overtaking a lady near the finish. The results have yet to appear, but according to my own records I was 2 minutes 20 second faster than 2015. Next week training will have to fit in with a strange week. 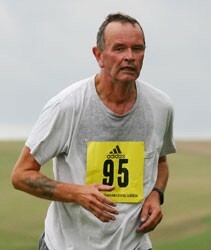 I have to go to London, so may miss Wednesday night with the Striders, and Sunday is the day of the Brighton 10k. So it will probably be a low-mileage week. The only other race in the offing is the Crowborough 10k, the following Sunday, the last event of the Sussex Grand Prix. 105 days till the Brighton Half. Mais ou sont les demi-marathones d'antan? When trying to work out my target time for the Brighton half next February, I looked back to the half-marathons of my past. They show a decline, I’m sorry to say, but in 2004 I was a sprightly 49 year old. Therefore to finish Brighton in under 2:15, I need to recover the form of my 2012 Eastbourne half or my 2010 Hastings. That’s not impossible. Some of the very slow times have been for very hilly off-road races, whereas Brighton is largely flat. Training started on Monday for the 2017 Brighton Half Marathon. I’m running to support the Stroke Association. I haven’t run a race for a charity for at least ten years, not since the 2005 London Marathon, which I ran for the Blue Cross. So why now? The reason is that our son’s partner, Jemimah, mother of our grandson Teddy, had lots of support from the Stroke Association during her recovery from a stroke she suffered at the age of 19, and I want to help them to thank them for the help they gave Jemimah, so they can support more people recovering from strokes. You can read more of Jemimah’s story in the Brighton Argus and in the Summer 2016 issue of the Stroke Association’s newsletter (pages 30-31). You can support my half-marathon at https://www.justgiving.com/fundraising/Tom-Roper. My best time for this race was 1:43:14 in 2005, and I won't be as fast, but I'll finish, I hope in under 2:15. That’s going to take some work. Recent half-marathons have been slower, but it’s a fast course, and I’m putting the training hours in.